I've mentioned on my blog before about how I get really bad under eye circles, I started to get them in my teens and they look as if they are not going anywhere now. I thought I'd share with you my current routine when it comes to keeping them at bay - from trying to treat them to trying to conceal them. 01// Liz Earle Smoothing Line Serum (buy here) - At night, after I've removed all my make-up, I like to pat on this gel-like serum on the under eye area. You hardly need to use any at all so this little bottle is going to last me a while. It's very soothing and although it is focused on anti-ageing I find it is good for a moisture boost. 02// Liz Earle Daily Eye Repair (buy here) - So once I've woken up in the morning and washed my face I use this Daily Eye Repair cream. I have fallen in love with this cream, it protects the area from UV and contains SPF 10 but also has this gorgeous iridescent quality to it which brightens up the circles. It is the perfect base for my under eye make-up. 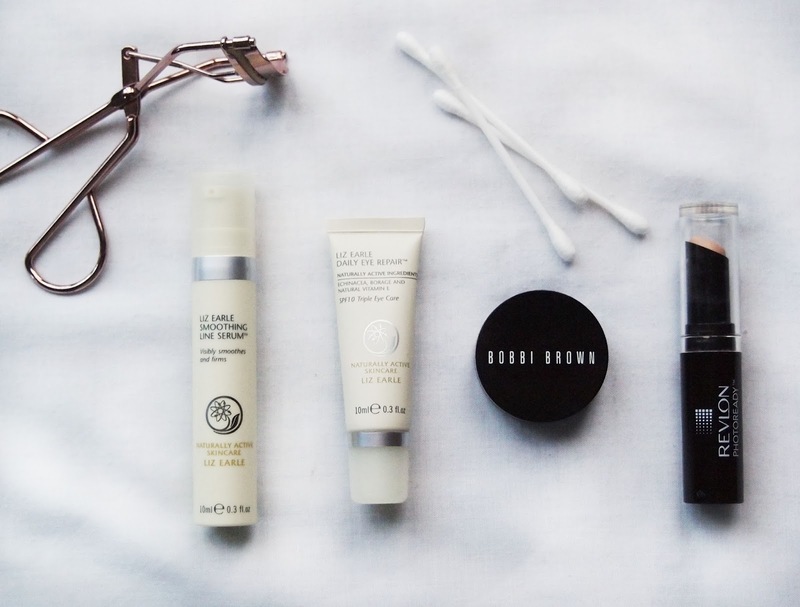 03// Bobbi Brown Corrector (buy here) - I've talked about this wonder product so many times, nothing has come close to comparing to it (which means I still have to fork out £18 every few months to replace it). It is a fabulously high pigmented pink based concealer that neutralises my purple circles. It is AMAZING. 04// Revlon PhotoReady Concealer (buy here) - I bought this one a whim whilst in Boots as I wanted to try something different from the Collection 2000 concealer and it is a really nice product. It is really soft and blendable for a stick concealer and the pigmentation is perfect for under the eyes. I use just a little to add some yellow tones to the area (after the Bobbi Brown Corrector it can look a little pink) and buff it out with my Real Techniques Buffing Brush. So there you have it, a little insight into how I treat my pesky circles. If you have any tips of suggestions please send them my way - I'd love to try out some new things!